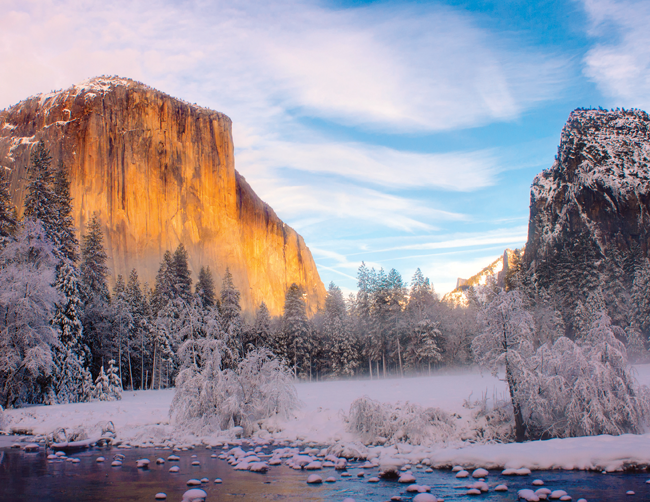 Whether you go glam (or glamping), Yosemite in the wintertime brings a special quiet beauty and the place to yourself. Six years ago, inside what was then The Ahwahnee hotel in Yosemite Valley, while January snow fell outside our window that overlooked the meadow and granite walls of the national park, I stared in horror at my cellphone. No service. Back home in Folsom, one of my daughters had a school scheduling snafu, and the situation had blown up just as her dad and I were leaving cell coverage area. I figured the national park would have coverage and I’d be able to finish coaching her through the problem from afar. In the end, with the hotel’s Wi-Fi, I was able to help, but not easily—connection was spotty, the actual landline impractical because of the unfolding nature of the problem (attending an event, I could not sit by the phone in the room), and multiple people were involved. Our winter getaway started off with a lot of grousing about how this was a terrible time to take a trip. Half Dome and the Merced River. Plus, it’s beautiful. The park’s granite walls create a late sunrise and early sundown, and the southern side of the park stays shaded much of the day. It’s quiet and gray and cold. With snowfall (let’s hope there is some! ), trees stack with sugar and meadows turn into broad, white blankets. In the wintertime, you’re more limited where you can go, but even that ends up being a bit of a blessing. Sometimes it’s nice to have some decisions made for you. 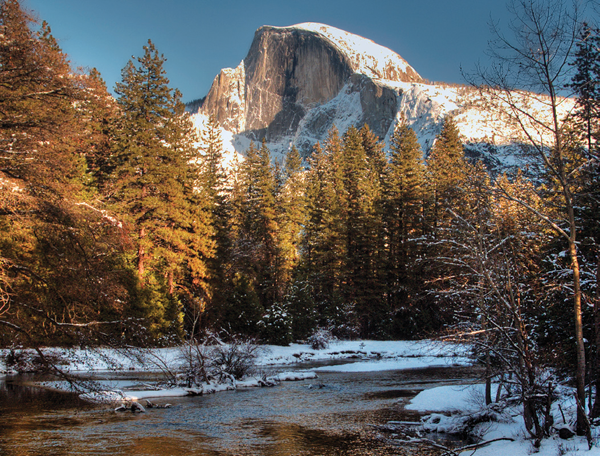 In the spirit of helping with decisions, I’ll share a few of our favorite things about Yosemite in the winter. 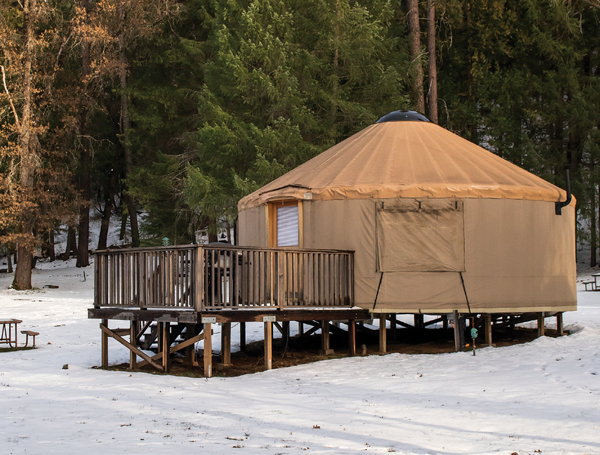 A yurt near Yosemite. Photo by Gabriel Teague. Snow Days—Assuming the white stuff flies, Yosemite Ski & Snowboard Area will open for downhill and cross-country skiing, snowboarding, tubing and snowshoeing. Some highlights: a guided 10-mile cross-country ski excursion to stay overnight at the Glacier Point Ski Hut (prices start at $140 per night) and the full-moon snowshoe walk ($35), when the Sierra’s multitudes of stars dim only a little by the light of the moon. A daytime snowshoe walk led by a National Park Service ranger is free, no equipment rental cost (although donations are appreciated). Just show up at 10:30 a.m. at the Nordic Center in the ski area. For more snow fun, a snow play area awaits just inside the Big Oak Flat Road park entrance and another at Tenaya Lodge. Again, watch the weather reports: Last year, Yosemite Ski & Snowboard Area never opened because by the time snow fell, the season had nearly ended. On Ice—Snow or not, the Half Dome Village Ice Rink goes up in the winter months, providing a sweet spot for figure eights, glides and holding hands within view of Half Dome—followed by hot chocolate next to the campfire. It costs about 10 bucks per skater, plus a $4 skate-rental fee, and helmets are available upon request. Staying Indoors—If the temps dip too low during your visit, no worries; just enjoy the park’s indoor fun. Some of Yosemite’s attractions remain open year-round, including the museums, The Ansel Adams Gallery and gift shops, near Yosemite Falls. If you’re lucky, the falls will have resumed—in November, they were dry. “Yosemite Walls,” said the tour guide who led our history walk near The Majestic. The Ansel Adams Gallery, full of Adams’ famous photography as well as works by other artists and photographers, makes a great place to warm up. Another: Yosemite Valley Visitor Center and Yosemite Museum, where you’ll learn all about the valley’s history. (Pop into the theater for a short film, “Spirit of Yosemite,” that celebrates the visual splendor of the park.) If you’re hungry, Degnan’s Kitchen remains open during the winter days for soup, sandwiches and espresso drinks. At Yosemite Valley Lodge, a Starbucks beckons in Base Camp Eatery, the remodeled food court. The LEED-certified space is pretty, with vaulted ceilings and exposed beams, reclaimed redwood and details (like metal brackets resembling vintage mountain-climbing tools) that reflect its surroundings. While it wasn’t entirely welcomed (some 25,000 people signed a petition in protest), one look at your fellow park visitors will tell you it’s popular. For dinner at the lodge, the Mountain Room has a menu that includes prime cuts of beef with classic sauces such as béarnaise, mushroom and blue cheese butter. The dining room at The Majestic. Photo by Yosemite Hospitality. A Word About Names—If you haven’t been to Yosemite in a while, you might be confused by some of the names. After a trademark tussle between former and current park concessionaires in 2016, The Ahwahnee became The Majestic Yosemite Hotel; everything Curry became Half Dome (for example, Camp Curry is now Half Dome Village); Yosemite Lodge is now Yosemite Valley Lodge, Wawona Hotel is now Big Trees Lodge; and Badger Pass Ski Area is now Yosemite Ski & Snowboard Area. Some signage has changed, but others have not. Our shuttle stop at The Majestic, for example, said “The Majestic” on the main stop along the roadway, but “The Ahwahnee” on the posted map of the shuttle route. If you get a thorough shuttle driver, you’ll be given both names. Basically, there is none. That’s a bit of an exaggeration—supposedly AT&T customers can get some service at various points in the valley. Park staff reminisce joyfully about the days of a presidential visit—the Obamas came to the park in spring 2016—when for a few weeks surrounding their stay, cell coverage expanded into all corners of the park, for security reasons. But unless you’re in Yosemite with the president (and that brings problems of its own), be ready for a digital detox.